A perfect side dish for entertaining, this elegant salad is surprisingly easy to make. 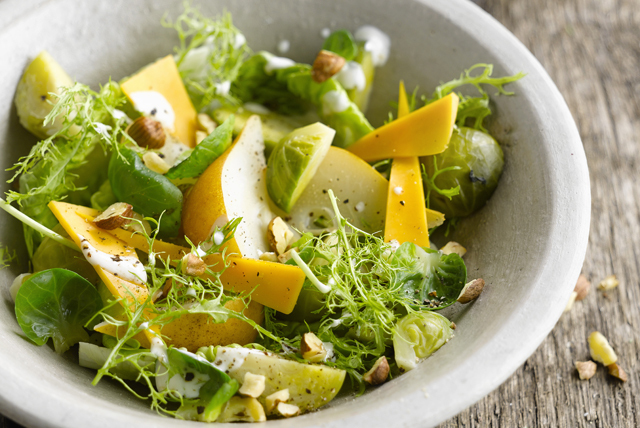 Fresh Brussels sprouts team up with cheddar cheese and creamy dressing for this delicious side. Why wait? Serve it tonight. Cook Brussels sprouts in large saucepan of boiling water 5 min. or until crisp-tender; drain. Rinse with cold water; drain well. Cut cheese slices diagonally in half; cut Brussels sprouts into quarters. Cover platter with frisee; top with cheese, Brussels sprouts and pears. Sprinkle with nuts. Mix dressing with 1 minced garlic clove before drizzling over salad.